« Proud to be in the 2%! Just because I haven’t been posting doesn’t mean the datalogger hasn’t been logging. 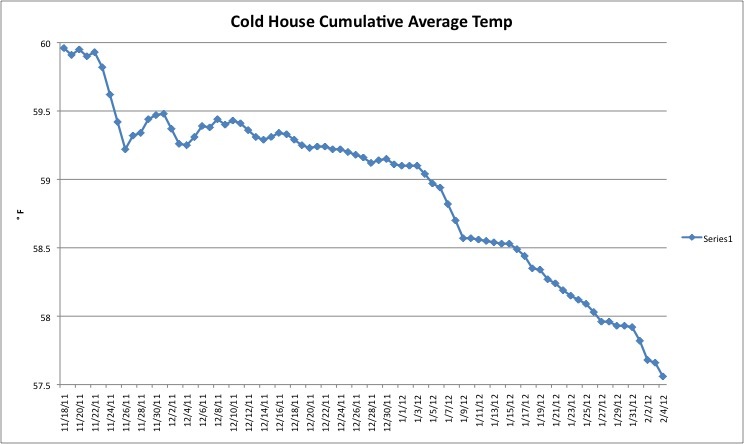 And I’ve finally gotten around to crunching some data for this winter, and making some graphs. 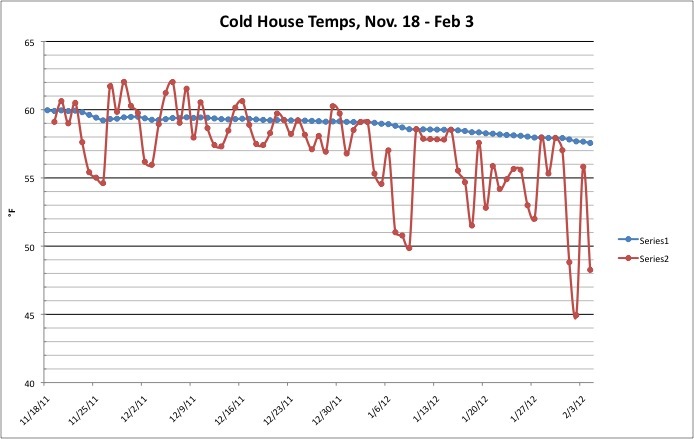 Here’s the text version: Since the first fire (October 26), the overall average temperature in the kitchen/livingroom has been 57.7 °F. But this has been drifting downwards: over the past week, the average has been 52.6. The warmest average day was 11/29, at 62° (steaming! ), and the coldest was the day before yesterday, at 44.9. Keep in mind, this is the warm part of the house. The bedroom, bathroom, weird creepy space under the cellar stairs, etc. are all chillier. But, still, not as chilly as last year– we have not, for instance, had any mornings in the 30’s in the bedroom yet. It really just hasn’t been that cold of a winter, and it doesn’t look like it is going to turn into one. This entry was posted on February 3, 2012 at 10:35 pm and is filed under Hard data. You can follow any responses to this entry through the RSS 2.0 feed. You can leave a response, or trackback from your own site.